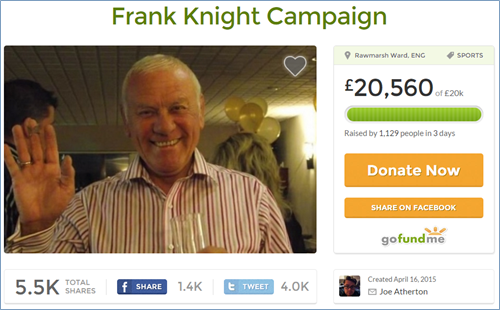 A fund-raising campaign to raise money for a Blackpool fan who was sued by the club’s owners has smashed its £20,000 target today. Frank Knight, a 67-year-old pensioner, was sued by the Oyston family after posting comments on his Facebook page which criticised Tangerines directors Karl and Owen Oyston’s much-maligned and oft-protested ownership of the club. The Oystons settled out of court with Knight, with the latter required to pay £20,000 in compensation and also post a public apology on Facebook accepting that his previous comments were defamatory. Disgusted at his treatment, Blackpool fan Joe Atherton (@oldathers) set up a GoFundMe account in Knight’s name despite having never met him, with football fans from all over the world – even Preston! – rallying around to pay for his legal bills bit-by-bit. Just when your faith in all humanity is in the toilet, something like this comes along and restores it once again. Well played everyone, well played indeed. Just when your faith in all humanity is in the toilet. People are cool. We all know that. Businessmen & politicians would love us to think otherwise though, and it hasn’t stopped the Oyston’s drawing breath. This should be the start of something bigger; the begining of the end. Next, we ‘the people’ need lawyers to offer gratis (or paid for through organisationslike GoFundMe) to those challenging laws designed to protect the ivory tower. This is is how we get control of our lives back.